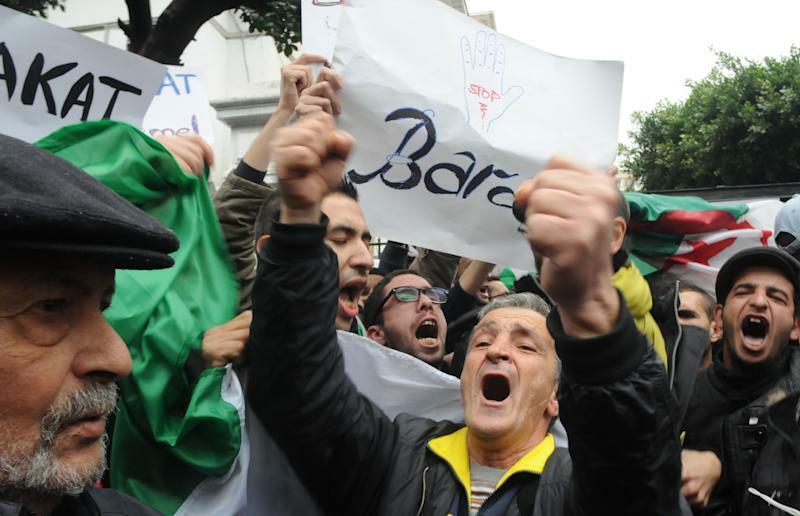 ALGIERS, Algeria (AP) — About 100 Algerian activists from a new anti-government movement staged a rare protest Saturday against the ailing president and his decision to run for a fourth term. While there was a heavy police presence, officers didn't violently disperse the young protesters from the "Barakat!" (Enough) group like they did in similar demonstrations earlier this month. "The state backed off after the images of repression from last week," group co-founder Amira Bouraoui said, adding that future protests would take place outside the capital. "We will continue our fight against the election and the system." The 77-year-old president, Abdelaziz Bouteflika, will be running for a fourth term after 15 years in power, despite having a stroke last year that has made his speech and movement difficult. While six candidates have been approved for the April 17 elections, Bouteflika is expected to win with the backing of the powerful machinery of the state. The oil and gas-rich North African nation has a tightly controlled political system dominated by the military and a ruling party. Most of Algeria's economy relies on its hydrocarbon wealth and so produces few jobs for its rapidly expanding population of 38 million. Despite Barakat's small numbers and the heavy opposition it faces from a powerful state, local analysts are describing it as an important development. They say it brings to mind Egypt's Kifaya (which also means "enough") movement against President Hosni Mubarak that eventually led to the uprising that overthrew the government. "It is an alternative to the classic political parties that have failed and it makes us think of the youth behind the Arab Spring in Tunisia and Egypt," said Rachid Tlemcani, a political analyst at University of Algiers, who said the movement's rough treatment by authorities showed the system's insecurity. "It is afraid that this movement could be a catalyst for a wider conflagration because all the ingredients for an explosion are there." Algeria was barely affected by a wave of pro-democracy protests that swept the Arab world in 2011, in part many say because of a decade-long battle against an Islamist insurgency in the 1990s that left 200,000 dead. In fact, many of those on the street watching Saturday's small protest questioned whether Algeria needed any instability, pointing out that Arab Spring countries like Egypt and Libya were in bad shape. "I think it's worth keeping an eye on," said William Lawrence, a North Africa expert at George Washington University. 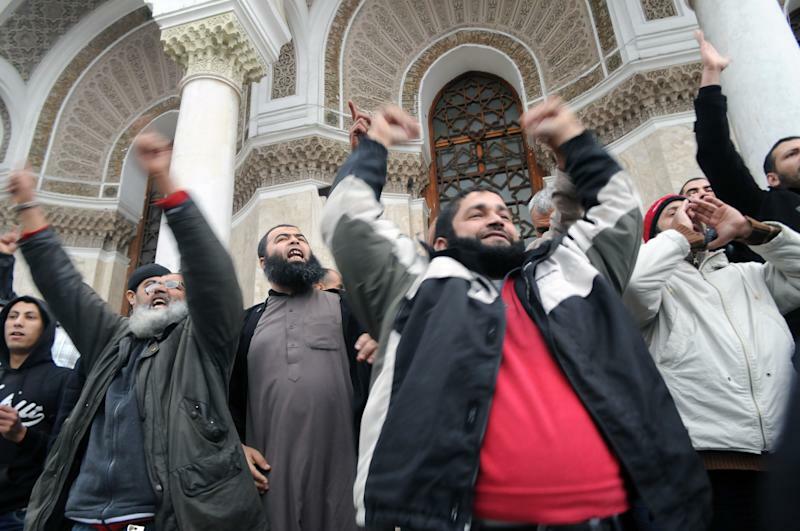 "It's evidence that civil society is not dead in Algeria." He noted though that most protests in Algeria tend to focus on economic issues rather than political issues because people know the state will respond by throwing money at the problem. As a measure of the challenge faced by any opposition, thousands of student leaders affiliated with the ruling party were bused to a stadium across the city for support rallies for the president at the same time as the small Barakat protest took place. Student leaders promised "millions" of votes for Bouteflika and scoffed at the "dozens" of protesters with the Barakat movement. In his speech at the rally, Prime Minister Abdelmalek Sellal, also the president's campaign manager, dismissed the Arab Spring as a mosquito to be "eliminated with bug spray." Schemm reported from Rabat, Morocco.